El Análisis de los negocios o Business Analytics (BA), es una herramienta de apoyo a la toma de decisiones gerenciales, de incipiente penetración en el contexto empresarial colombiano, que se apoya fundamentalmente en los modelos de madurez procedentes de la ingeniería del software. El objetivo del artículo es desarrollar un modelo de servicio en BA para la gestión del talento humano y diagnosticar las capacidades de BA de esta área funcional en una gran empresa del sector energético en Medellín, Colombia. Metodológicamente, se articula el análisis documental con la recolección de información cualitativa. En cuanto a los resultados, el modelo desarrollado consta de cinco módulos, el primero, Caso de Negocio, se relaciona con el diagnóstico del proceso analítico, cuya realización permitió identificar dificultades en la integración de la información sobre talento humano de las empresas del grupo empresarial, lo cual impide madurar otras capacidades de BA asociadas al entendimiento y modelamiento de las acciones y resultados de esta área, así como la predicción de escenarios futuros. PALABRAS CLAVES: Análisis de negocios (BA), Recursos y capacidades, Capacidades dinámicas, modelos de madurez, gestión del talento humano. Business Analytics (BA) is a tool to support management decision making, unfortunately, its penetration is low in the Colombian business context and that is based mainly on maturity models from software engineering. The aim of this paper is to develop a service model on BA for human resources management (HRM) and diagnostic capabilities BA of this functional area in a big energy company in Medellin, Colombia. In this research were articulated the document analysis with the qualitative data collection. As a result, the developed model consists of five modules, the first Business Case, is related to the diagnosis of the analytical process in TH area, to showed some difficulties in integrating information from companies of business group, this represents a problem for developing other BA capabilities related to understanding and modeling the actions and results in this area, as well as predicting future scenarios. KEYWORDS: Business Analysis (BA), resources and capabilities, dynamic capabilities, maturity models, talent management. Forma de citar: Perdomo Charry, G., & Arias Pérez, J.E. (2014). Modelo de servicio en business analytics orientado a la gestión del talento humano. En R, Llamosa Villalba (Ed.). 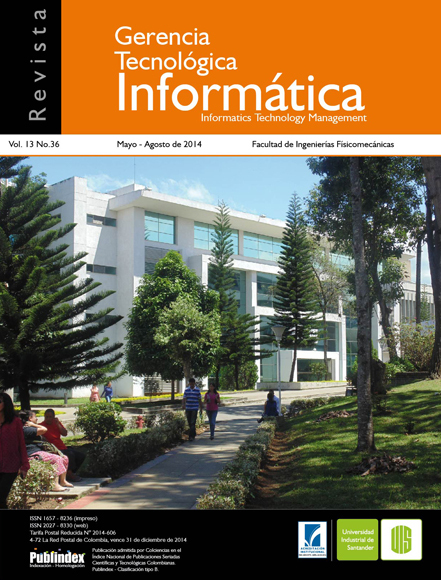 Revista Gerencia Tecnológica Informática, 13(36), 61-73. ISSN 1657-8236. Oh, W., & Pinsonneault, A. (2007). On the assessment of the strategic value of information technologies: conceptual and analytical approaches. MIS quarterly, 239-265. Kim, G., Shin, B., Kim, K. K., & Lee, H. G. (2011). IT capabilities, process-oriented dynamic capabilities, and firm financial performance. Journal of the Association for Information Systems, 12(7), 487- 517. Becker, J., Knackstedt, R., & Pöppelbuß, J. (2009). Developing Maturity Models for IT Management – A Procedure Model and its Application. Business & Information Systems Engineering, 1(3), 213-222. Lu, Y., & Ramamurthy, K. (2011). Understanding the link between information technology capability and organizational agility: An empirical examination. Mis Quarterly, 35(4), 931-954. Cosic, R., Shanks, G., & Maynard, S. (2012). Towards a Business Analytics Capability Maturity Model. En 23RD Australasian Conference On Information Systems. Geelong, Australia: School of Information Systems. Davenport, T., & Harris, J.G. (2007). Competing on Analytics: The New Science of Winning. Boston: Harvard Business School Press. Davenport, T., Harris, J., & Morison, R. (2010). Analytics at work: Smarter decisions, Better Result. Boston: Harvard Business Press. De Bruin, T. (2009). Business process management: Theory on progression and maturity. Tesis doctoral no publicada. Queensland University of Technology, Brisbane, Australia. Jac, F. E. (2010). The New HR Analytics: Predicting the Economic Value of Your Company’s Human Capital Investments. AMACOM Div American Mgmt Assn. Fitz-Enz, J. (2010). The New HR Analytics: Predicting the Economic Value of Your Company’s Human Capital Investments. New York: AMACOM. Khan, R. A., & Quadri, S. M. K. (2012). Business intelligence: an integrated approach. Business Intelligence Journal, 5(1), 64-70. Gregor, S. (2006). The Nature of Theory in Information Systems. MIS Quarterly, 3(30), 611- 642. Yalcinkaya, G., Calantone, R. J., & Griffith, D. A. (2007). An examination of exploration and exploitation capabilities: implications for product innovation and market performance. Journal of International Marketing, 15(4), 63-93. IBM. (2011). Getting Smart About Your Workforce. Why Analytics Matter. Ottawa, EEUU. Recuperado (2012, noviembre 20) de http://www- 935.ibm. com/services/us/gbs/bus/pdf/getting-smartabout-your-workforce_wp_final.pdf. Holsapple, C., Lee-Post, A., & Pakath, R. (2014). A Unified Foundation for Business Analytics. Decision Support Systems. Kohavi, R., Rothleder, N., & Simoudis, E. (2002). Emerging Trends in Business Analytics. Communications of the ACM, 45(8), 45-48. Olszak, C. M. (2013, September). Assessment of business intelligence maturity in the selected organizations. In Computer Science and Information Systems (FedCSIS), 2013 Federated Conference on (pp. 951-958). IEEE. Jackson, S. (2011). Organizational culture and information systems adoption: A three-perspective approach. Information and Organization, 21(2), 57-83. Maier, A., Moultrie, J., & Clarkson, P. (2012). Assessing Organisational Capabilities: Reviewing and Guiding the Development of Maturity Grids. IEEE Transactions on Engineering Management, 59(1), 138-159. Marr, B. (2010). The Intelligence Company. Chichester: John Wiley & Sons. Wendler, R. (2012). The maturity of maturity model research: A systematic mapping study. Information and software technology, 54(12), 1317-1339. Trkman, P., McCormack, K., De Oliveira, M. P. V., & Ladeira, M. B. (2010). The impact of business analytics on supply chain performance. Decision Support Systems, 49(3), 318-327. Nevo, S., & Wade, M. (2011). Firm-level benefits of IT-enabled resources: A conceptual extension and an empirical assessment. The Journal of Strategic Information Systems, 20(4), 403-418. Raber, D., Winter, R., & Wortmann, F. (2012, January). Using quantitative analyses to construct a capability maturity model for business intelligence. In System Science (HICSS), 2012 45th Hawaii International Conference on (pp. 4219-4228). IEEE. Paulk, M., Weber, C., Garcia, S., Chirssis, M., Bush, M. (1993). Capability Maturity Model for Software, Version 1.1, Carnegie Mellon University, Pittsburgh. Recuperado (2012, Noviembre 20) de http://faculty.ksu.edu.sa/ghazy/CSC548_Sample2/ tr24.93.pdf. Pavlou, P. A., & El Sawy, O. A. (2010). The “third hand”: IT-enabled competitive advantage in turbulence through improvisational capabilities. Information Systems Research, 21(3), 443-471. Crié, D., & Micheaux, A. (2006). From customer data to value: What is lacking in the information chain?. The Journal of Database Marketing & Customer Strategy Management, 13(4), 282-299. Popovic, A; Turk, T., & Jaklic, J. (2010). Conceptual model of business value of business intelligence systems. Management: Journal of Contemporary Management Issues, 15(1), 5-30. Min-Hooi, C., & Kee-Luen, W. (2011). A review of business intelligence and its maturity models. African Journal of Business Management, 5(9), 3424-3428. Shanks, G. G., & Bekmamedova, N. (2012, June). Integrating Business Analytics Systems with the Enterprise Environment: an Evolutionary Process Perspective. In DSS (pp. 161-172). Shanks, G., Bekmamedova, N., & Willcocks, L. (2013). Using business analytics for strategic alignment and organisational transformation. International Journal of Business Intelligence Research (IJBIR), 4(3), 1-15. Shanks, G., & Bekmamedova, N. (2012). Achieving benefits with business analytics systems: an evolutionary process perspective. Journal of Decision Systems, 21(3), 231-244. Teece, D., Pisano, G., & Shuen, A. (1997). Dynamic capabilities and strategic management, Strategic Management Journal, 18(7), 509-533. Rivard, S., Raymond, L., & Verreault, D. (2006). Resource-based view and competitive strategy: An integrated model of the contribution of information technology to firm performance. The Journal of Strategic Information Systems, 15(1), 29-50. Watson, H. (2001). Recent Developments in Data Warehousing, Communications of AIS, 8(1), 1-25, 2001. Charlier, S. D., Brown, K. G., & Rynes, S. L. (2011). Teaching evidence-based management in MBA programs: What evidence is there?. Academy of Management Learning & Education, 10(2), 222- 236. WEF. (2012). Global Talent Risk – Seven Responses, Global Talent Report 2011 Recuperado (2012, noviembre 20) de http://www3.weforum.org/ docs/PS_WEF_GlobalTalentRisk_Report_2011.pdf. Tiwana, A., & Konsynski, B. (2010). Complementarities between organizational IT architecture and governance structure. Information Systems Research, 21(2), 288-304. Wixom, B., & Watson, H. (2010). The BI Based Organization. International Journal of Business Intelligence Research, 1(1), 13-28.